This West Delhi housewife skiied over 915 km in 38 days, passing through some of the most desolate regions in the world to become the first Indian woman to ski her way to the South Pole as part of the Commonwealth Women’s Antarctic Expedition in 2009. In doing that, Reena Kaushal Dharmshaktu not only braved blizzards, crevasses and temperatures below minus 40 degrees Celsius but also encouraged people to think about their ultimate ambition and to take steps towards turning that dream into reality. She continues to seek new horizons and at the same time campaign for the Leave-No-Trace philosophy. She likes to make people more aware about the importance of preserving the environment. She wishes that people would realise that every little thing – separating the biodegradable waste form the non-degradable waste – can contribute majorly to a better environment. She was part of a 15-woman cycling expedition -- Go Green Girls – from Kolkata to Kanyakumari, covering nearly 3000km in 35 days in early 2011 and promote a clean, green and healthy environment. This freelance outdoor instructor from Darjeeling has made Delhi her home. An experienced mountaineer, she has been on several expeditions in the Himalayas and has received the prestigious Tenzing Norgay National Adventure Award. In pursuing her dreams, she has shown that she is mentally and physically strong with tolerance for adversity and uncertainty. Indeed, Reena Kaushal Dharmshaktu showcases indefatigable spirit that embodies daredevilry. 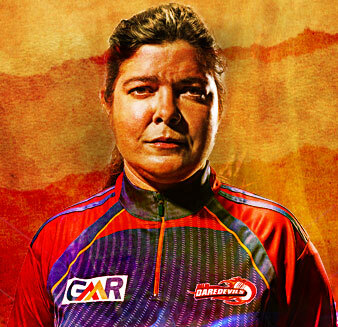 We are honoured to welcome her as a Delhi Daredevils Super Fan.